LONDON--(BUSINESS WIRE)--Technavio has announced their latest pipeline analysis report on the Ewing’s sarcoma market. The report includes a detailed analysis of the pipeline molecules under investigation within the defined data collection period to treat Ewing’s sarcoma. Ewing’s sarcoma is a type of cancer that affects soft tissue and bones. It is a rare and malignant, round, blue cell tumor. Ewing’s sarcoma is common in pediatric patients, teenagers, and young adults. The most commonly affected areas are long bones, including the pelvic bone, femur, ribs, and collarbone. 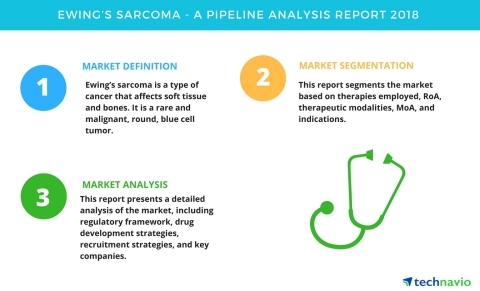 This market research report segments the Ewing’s sarcoma market based on therapies employed (monotherapy and combination therapy), RoA (intravenous, oral, intradermal, intratumoral, subcutaneous, and undisclosed), therapeutic modalities (small molecule, monoclonal antibody, and vaccine), MoA (VEGF inhibitor, IGF-1R inhibitor, tubulin polymerization, CD99 inhibitor, others, and undisclosed), drugs under development (phase I, phase I/II, phase II, pre-clinical, phase III, and discovery), and recruitment status (recruiting, active not recruiting, not yet recruiting, completed, and unknown). It provides an in-depth analysis of the prominent factors influencing the market, including drivers, opportunities, trends, and industry-specific challenges. Technavio has published a new report on the drug development pipeline for Ewing's sarcoma, including a detailed study of the pipeline molecules.